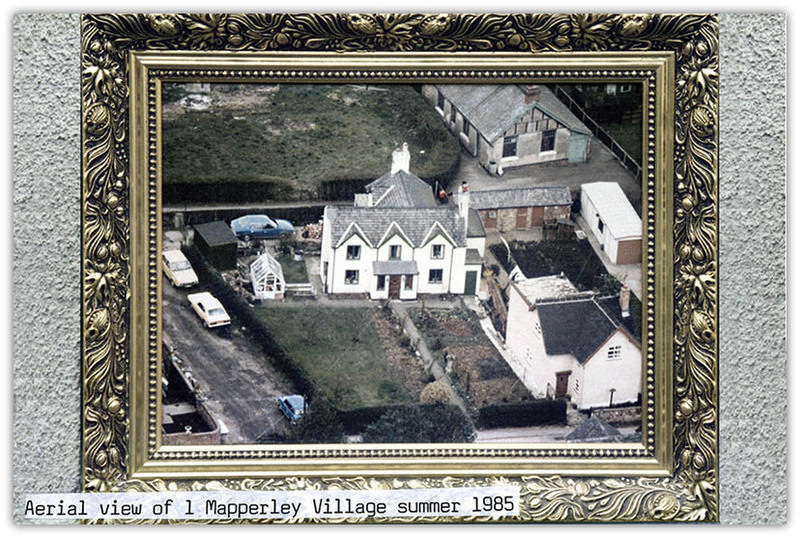 No 1 Mapperley village is one of the oldest remaining buildings in Mapperley. The house has a date stone for 1763 on the front wall. This represented Zechariah and Mary Wathey. They were married in Kirk Hallam Church 1759. He was one of the families who represented Mapperley on the Scargill School Trust as a trustee. First he was the son of Zackery Wathey (1679-1743) and Elizabeth Bartholomew (1680-1741). Zachariah was married twice. His first wife was Sarah Beardsley they married at Ilkeston on 26 October 1746. Sadly Sarah died in 1758. Following his first wife's death he re-married Mary Riley at Kirk Hallam on 7th October 1759. 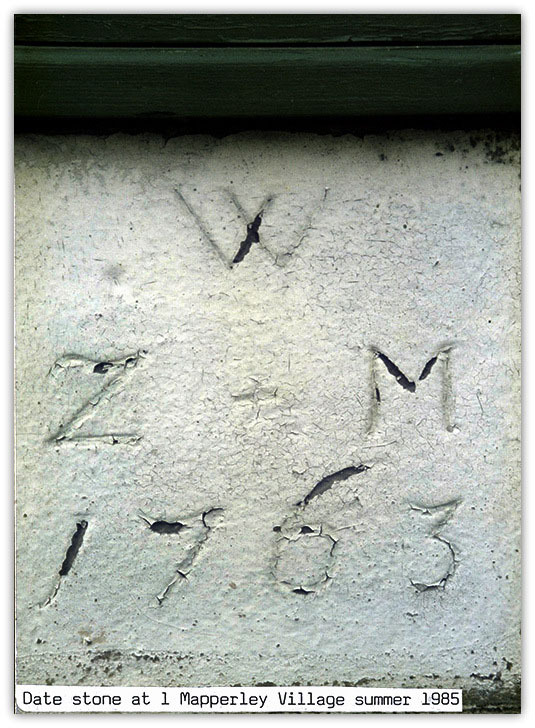 He later had the house built for his new wife and family and had the date stone built into the house with their initials. Zachery Wathey is named on a plaque which is dated 1758. It was originally built into the wall of the old first school positioned opposite the church gates following a school extension. When the new boys school was built in school square in 1832 the plaque was built into the new school wall. This can still be seen today. The attached book extract explains the plaque. The following singular inscription, which is quite a curiosity in its way, is carved on the stone over the Porch of the School. 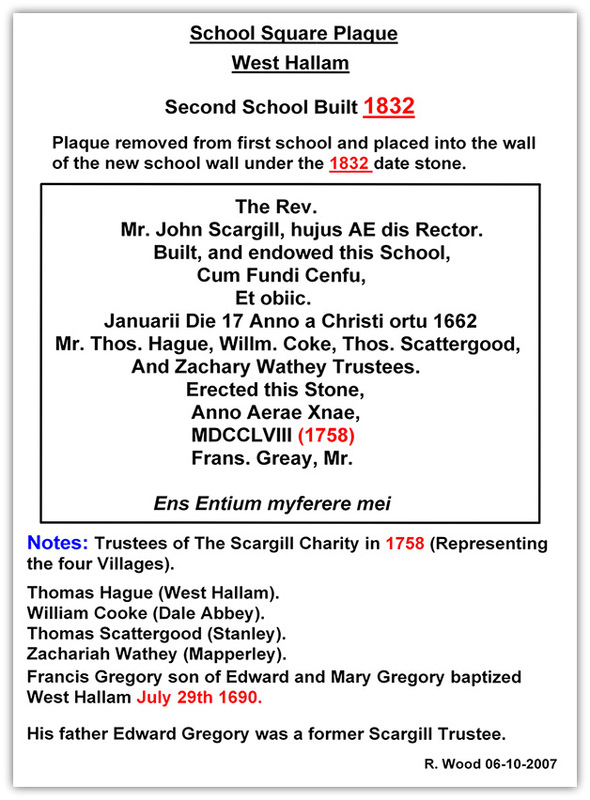 Above, transcript of the Scargill Boys school plaque built into the school wall in School Square West Hallam. The boys school was built in 1832 and the original plaque from the first village school was removed and built under the new school 1832 stone. 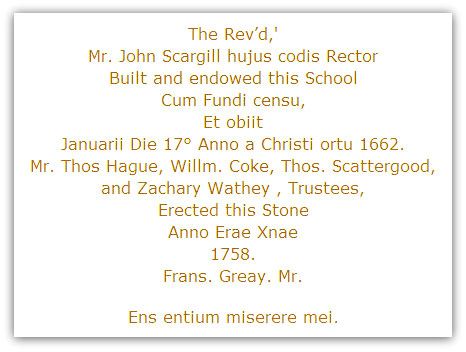 The first school was built opposite St. Wilfrid's church gates in 1664 to the instructions left in John Scargill's Will. 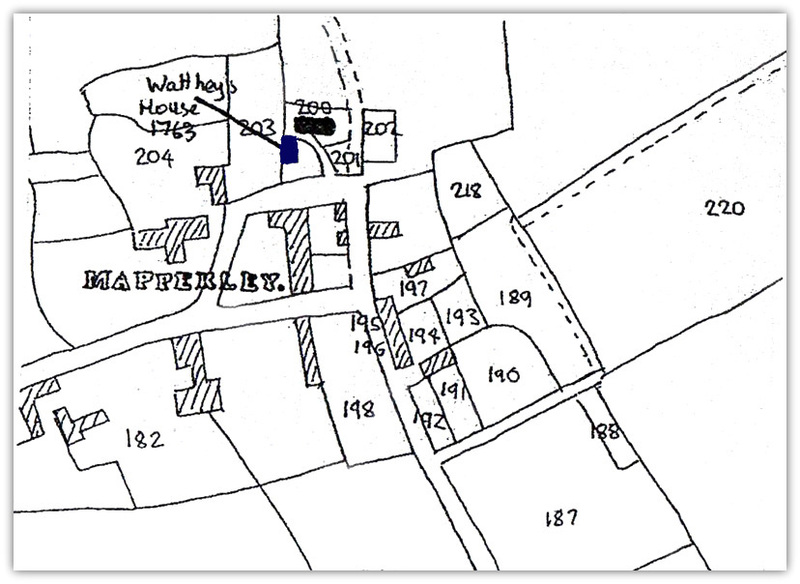 At a meeting held on 20 and 21st December 1790 Zachary Wathey of Mapperley was the only surviving trustee. He appointed John Sutton of Heanor to represent West Hallam. Thomas Martin was listed 1833. You can see how the name Zachariah and Zackery was used through each generation. The post of Scargill trustee was passed from father to son. The name Zachariah was passed down through the Wathey family for at least 3 generations. This is a (was) an old established Mapperley family. John Scargill’s will was written in 1664. The Wathey family became trustees soon after this date. The Mapperley burials register for Kirk Hallam by coincidence shows Zachariah Wathey listed as A1 in the churchyard. 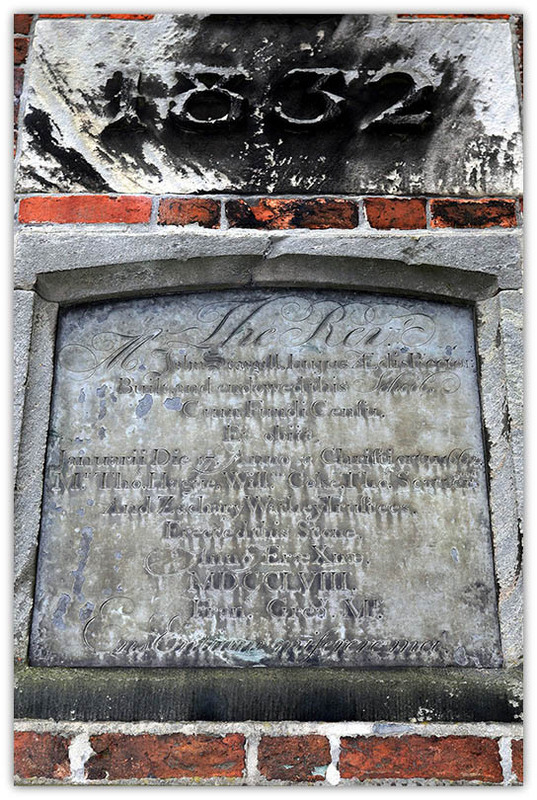 The inscription reads Zachariah Wathey son of Zachariah and Sarah Wathey of Mapperley died May 8th 1773 aged 26. In 1841 it was occupied by Hannah Wathey, and also owned by her. It had a thatched roof at one time. Next to it was another building which in 1842 was divided into three tenements, occupied by Elizabeth Mitchell, Edward Robinson and Leonard Hawley. This building is no longer in existence. Presumably it was demolished to make way for The Lodge home built on this site in 1857. Hannah Wathey aged 48 Farmer. Jane Wathey aged 9. (Grand daughter). Hannah Wathey aged 60 Widow. Hannah Wathey aged 67 Cottager. (She was obviously proud to live in the house as she called herself a Cottager. But she didn't like to give her true age).